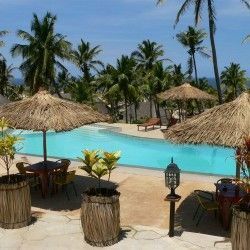 Blue Moon Beach Resort in Jangamo (Guinjata area), provides self-catering and bed and breakfast accommodation in beautiful palm tree surrounds. Come share our paradise... a special slice of Africa with breath-taking views of the ocean, coconut palms and cashew nut groves! 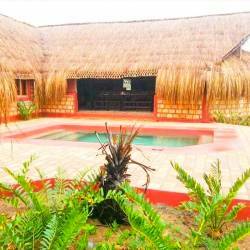 Blue Moon Beach Resort offers 20 tastefully decorated en-suite guest rooms and fully serviced holiday houses; all with ceiling fans or air-conditioners, sea views and wide breezy verandah's. 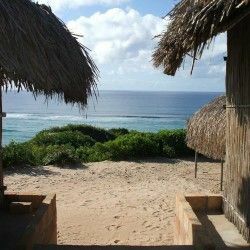 Enjoy the swimming pool, relax in the cocktail bar which overlooks the ocean and pool and spot the turtles and whales – the warm Indian Ocean provides a relaxing retreat for all. Guests may enjoy a sundowner in our restaurant which serves up fresh fruit and vegetables served with a choice of fresh fish, seafood or traditional recipes. Unwind on our terrace and watch the moon rise from the sea with a glass of champagne or cognac to celebrate the moment. Towels are provided for room use only. Guests are requested to bring own beach/pool towels. A 4x4 vehicle is not required. Parking for passenger vehicles is provided 300m from the resort. Guests (and their luggage) arriving in passenger vehicles will be collected from the parking area.